New Hampshire is home to over 7,000 miles of snowmobile trails that crisscross across the state connecting to trails in Maine, Vermont, and Quebec. To put that in perspective, if you were to drive from Manchester, NH to Sacramento, CA and back again, you’d only cover roughly 6,000 miles. That’s a lot of miles of trails! The White Mountains are New Hampshire’s premier outdoor destination year-round. From world-class hiking during the summer months to incredible panoramic views during the fall foliage season to some of the best skiing in the East during the winter, it’s time to head to the mountains. While it’s not as well known as other destinations in New Hampshire, snowmobiling in the White Mountains is an awesome experience. There's plenty to do if you don't want to snowmobile everyday. 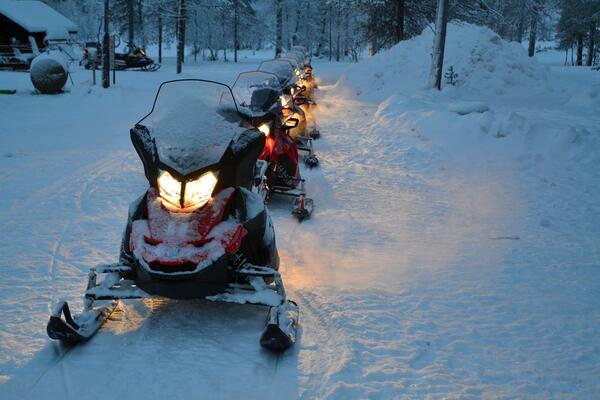 During the winter months, the White Mountain National Forest is open for snowmobilers. Trails are maintained by local snowmobile clubs, like the Twin Mountain Snowmobile Club, Presidential Ridge Runners, and the White Mountain Snowmobile Club among many others in the region. For the latest trail conditions, you can visit the New Hampshire Parks and Recreation website. For incredible views of the Presidential Range of the White Mountains, you’ll want to spend some time on the trails in Coos County. The Lead Mine Trail in Gorham offers a beautiful close-up view of Mt. Washington and the Gorham Valley. Alternatively, you can also get great views of the infamous peak on the Mt. Forist Trail in Berlin. The White Mt. Ridge Runners groom all of the trails in the eastern part of the White Mountains so check out their website for the latest trail conditions and maps. The Presidential Recreational Rail Trail is an 18-mile trail that runs between Cherry Pond and Berlin along the edge of the White Mountain National Forest. Built along the old Boston & Maine Railroad, the trail is groomed for snowmobiling and ATV use in the winter months. Bartlett and the Bear Notch region is a popular destination for snowmobilers in the central White Mountains. Home to 50 miles of wide, groomed trails, you’ll find plenty of great riding in the White Mountain National Forest. The Bear Notch Road Trail is a closed loop trail with great views of the mountains and forests. 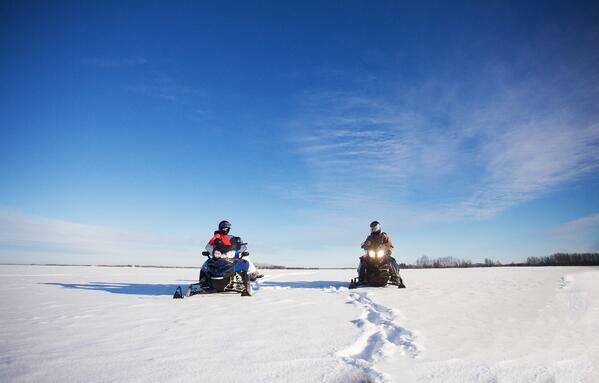 You can rent a sled from Northern Extremes Snowmobiling and enjoy a day out on the trails. 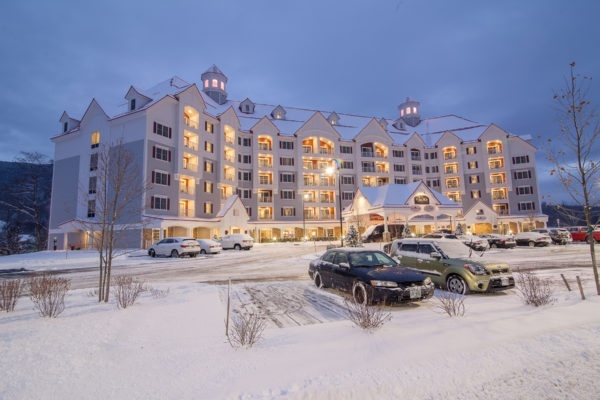 If you stop by the Northern Extremes Snowmobiling location at Bretton Woods, you can book a Mt. Washington Half Day Tour and ride up Jefferson Notch Road with an elevation of 3,007 feet. It’s the highest maintained road in the State of New Hampshire! As you journey through the Presidential Range, Jericho State Park, and back to Bretton Woods, you might even get to spot a moose! Home to Franconia Notch and many other mountain peaks, the western White Mountains are a wonderful place to hit the snowmobile trails. Just a little north of the White Mountains, the Ammonoosuc Rail Trail is a 19-mile trail that runs from Littleton to Woodsville and is an excellent groomed trail for snowmobiles and ATVs. The Franconia Notch State Park Recreational Trail is a 20-mile paved trail that parallels the Parkway in Franconia Notch State Park. During the winter months, the trail is open to snowmobiles and offers incredible views of the nearby mountains and popular attractions. From the trail, you’ll in easy reach of the Flume Gorge, the Old Man of the Mountain profile (may he rest in peace), Cannon Mountain Aerial Tramway, and Echo Lake among many other places. If you don’t have a snowmobile but would like to give the sport a try on your winter vacation, book a guided tour with Sledventures Snowmobile Rentals in Lincoln. 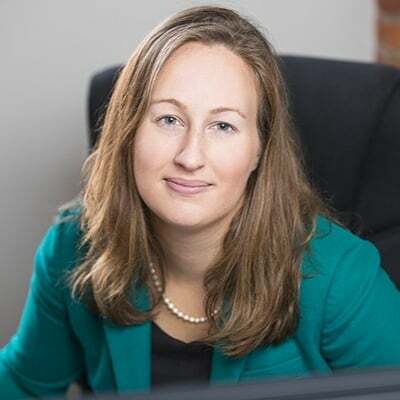 This family-friendly, locally-owned company provides affordable rentals and guided tours for beginners to experts. The 1.5-hour White Mountain Adventure Tour is perfect for newbies who would like to experience the enjoyment of riding through the western White Mountains. For more experienced riders who would like to challenge themselves, the White Mountain Expedition Tour offers challenging terrain with terrific scenery. Alternatively, you can’t go wrong with the views from the Franconia Notch Tour either. Many of Lincoln’s businesses, like the RiverWalk Resort, are located on snowmobile trails providing you with easy access to lots of great places to stop for a hot drink and a hearty meal. If you’re looking for trailside accommodations, there is snowmobile access to RiverWalk Resort’s parking lot making a snowmobile weekend getaway possible. With a restaurant, winery and spa on site, it's a great place to stop and warm up. Remember, if you are bringing your snowmobile from out-of-state, you are required by law to obtain a New Hampshire snowmobile registration to ride on any of New Hampshire’s 7,000 miles of trails. Visit the New Hampshire Fish and Game website for more information on where to register your snowmobile. 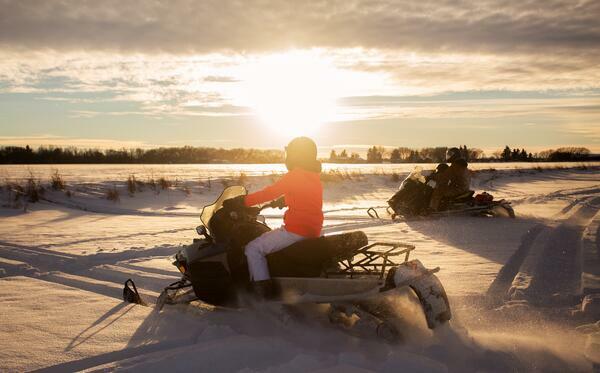 With more snow in the forecast, the snowmobiling will be better than ever. With hundreds of miles of pristine, groomed trails throughout the White Mountains, a snowmobile weekend getaway is just what Mother Nature called for this winter. And, since Punxsutawney Phil saw his shadow and predicted six more weeks of winter, you have plenty of time to hit the trails!